Now more than ever, it is important to let our individual selves shine brightly. We are coming into the shortest days of the year, accelerated busy-ness with the holidays and year-end work, and we are living in tumultuous times throughout the world. The antidote to darkness is light, and each and everyone one of us contains our own unique brand of light, whether it is a kind word, a gentle touch, thoughtful guidance respectfully given, sharing of yourself fully and honestly, compassion, empathy, and the capacity to listen. This month, as you go about your busy life, remember that a single word or gesture can change a life; that harsh words turned into constructive criticism can create a change; that taking time to breathe, to pause and reflect, can shift a bad day to a good day; and that small actions lead to big change, whether it is your relationships, job, or within yourself. Slow yourself down and embody the moment... embody yourself! Listen to the inner dialogue... I am hungry, I am tired, I am angry, I am happy, and feel the feelings. Nourish yourself and those you love, whether it is in the foods you prepare or the extra time you take to make something special. This December, make a commitment to be the light... be the change you want to see in yourself and in the world. Commit to one random act of kindness every day… a special lunch made for your children, your spouse, yourself!, hold a door, smile at a stranger, be kind to a colleague, be nice to the check out person at the grocery store or the bank teller. In doing so, you are building your moral muscle and strengthening your capacity to go beyond your daily life circumstances. And you are bringing a little bit of joy and appreciation into someone else’s life. Shine on and shine brightly, and may you and those you love enjoy the richness of the holiday season and time together. Season’s greetings from all of us at D’Adamo Personalized Nutrition. Highly Beneficial: Food that acts as a medicine. The Highly Beneficial foods advance your health or protect you from possible maladies. These foods are encouraged and should make up a good portion of your meal planning. Neutral: Food that acts like a food. Neutral foods provide required macronutrients and caloric energy. Neutrals can be eaten freely, and they provide variety to your diet, as well as enjoying seasonal offerings. Avoid: Food that acts like a poison. Avoid foods induce biological disorder or increase your chances of disease based on differences between the blood types. Foods that are Avoids should not be eaten, or their consumption should be minimized to lessen their negative health effects. 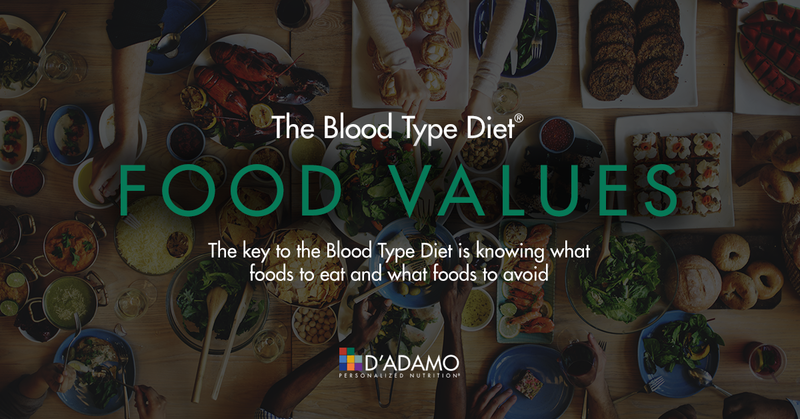 Twenty years later, the food values have remained a cornerstone of the Blood Type Diet. Through his continuing research, Dr. D’Adamo has further refined the food values, and longtime readers will notice differences in a small number of foods between the Anniversary edition and the original book. This is because Dr. D’Adamo has incorporated secretor values that he wrote about in Live Right for Your Type into updated food lists. The Anniversary edition uses the secretor values as the base values for the A, B, AB and O blood types. Additionally, Dr. D’Adamo has introduced a food key that designates what foods enhance carbohydrate metabolism and encourage weight loss as well as foods that increase or decrease microbiome diversity. Here's a sneak peak at the key, and you'll notice these icons listed throughout the food lists in the new edition. These enhancements help to make the Blood Type Diet even more effective and targeted, harnessing the genetic powerhouse of blood type and the current research to impact your metabolism, immunity, digestive process and healthy aging. 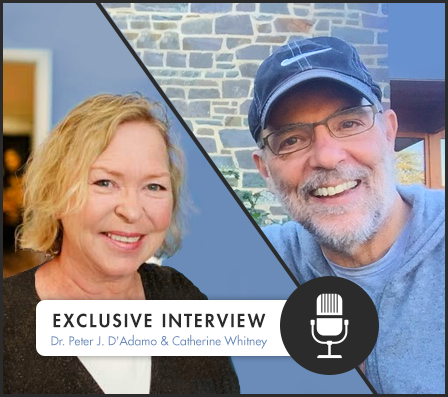 As we planned for the release of the 20th Anniversary edition of Eat Right for Your Type, we had an opportunity to sit down with Dr. Peter D'Adamo and Catherine Whitney to give us a glimpse of the behind the scenes of the writing of the original book and the 20 year odyssey they've shared as the world caught on to the personalized nutrition revolution and the Blood Type Diet. Twenty years ago, the niche market of personalized nutrition did not exist. How did the blood type diet change that? Fundamentally, I believe it opened people's eyes to the fact that genetics can have a very powerful influence on the health effects of the foods we eat. Nutrition thinking was still very much into the idea that there was 'one perfect diet' that would be supremely beneficial for everyone. We now know better. Sadly, many nutritionists still think this way. Which blood type are you, and what are your favorite go-to meals? I am a blood type A, and I follow a largely plant-based diet, with the occasional fish and poultry. I try to opt for a high-fiber breakfast, although I'll have an egg if I think the extra protein is necessary. I enjoy soups and enjoy making them with unique combinations of ingredients. I make a terrific spelt pasta with garlic, oil, broccoli rabe and pecorino romano cheese. And when I am on the go, some peanut or almond butter on manna bread makes a great snack. In appreciation for your continuing customer loyalty, we wanted to do something BIG for you this December, and we did it! Starting on December 1st and running through December 31st, we're offering double Personalized Points on every purchase you make online at D'Adamo Personalized Nutrition. Every web order counts, every product counts, and all you need to do is to make sure you log into your 4yourtype.com account and place your orders online (guest logins and phone orders are excluded). Don't miss out on this great opportunity to double your earnings. You can earn points in December and redeem them any time. This is our way of saying thank you for being such a loyal customer. With the holidays coming up quickly, we all are thinking about those special people in our lives and what to give them. 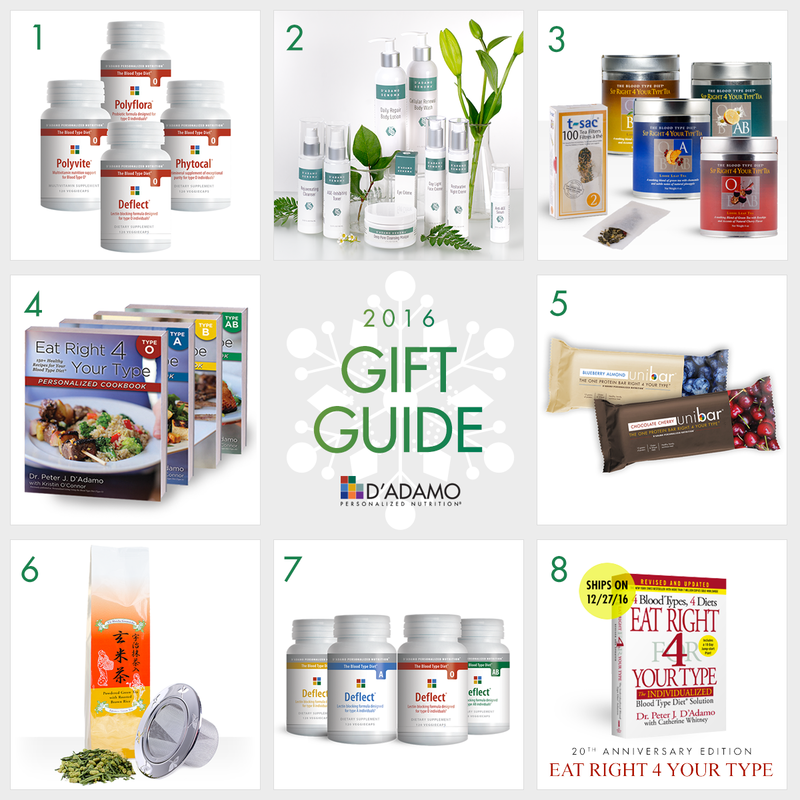 If they don't need yet another sweater or scarf, be creative and give the gift of health and the possibility of renewed vigor with one of our selected products from D'Adamo Personalized Nutrition. The range is wide -- from a signed copy of the soon to be released 20th Anniversary Edition of Eat Right 4 Your Type, to blood type specific vitamins, clean skin care or tasty teas and bars, we have a selection of products that can make your gift giving not only meaningful but also life enhancing. And remember, when you give your gifts, give the gift of your time as well...enjoy the companionship of a moment spent together, a phone call, a personal note. These are the things that are most valuable in all of our lives. Happy holidays! 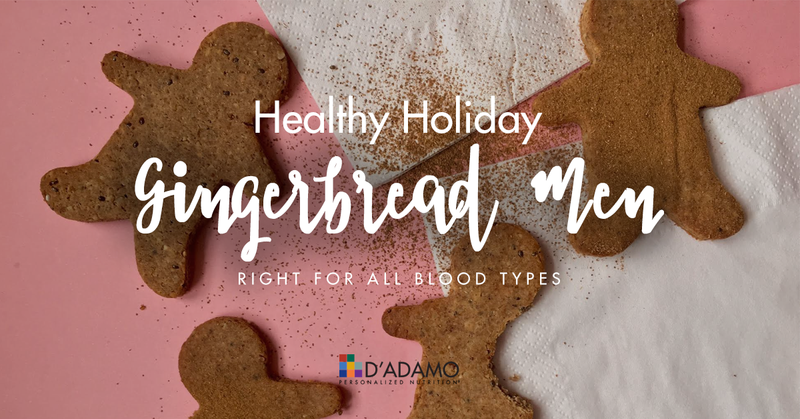 Sweet treat: These Gingerbread men are low in sugar, and are delicious paired with your favorite nut butter and a sprinkle of cacao nibs or berries! Preheat your over to 360 degrees. In a electric mixer, pulse all of the ingredients together, apart from the water. When all ingredients are well incorporated, mix in the water, 1 tbsp at a time. Add the water you need until you get a soft dough - but not gooey. Take out your dough from the mixer and make a dough ball. On a sheet of greaseproof paper, place your dough ball and cover with a second sheet of greaseproof paper. With a rolling pin, spread out the dough to a uniform thickness of about a quarter inch. Refrigerate for 10 minutes. Prepare your baking tray and line with baking parchment. Remove flattened dough from the fridge. Peel off top greaseproof sheet, and start cutting out your gingerbread men with your cookie cutter. Place them on your tray and bake for 12-15 minutes until firm and golden brown. Cool your biscuits on a rack before storing them in an airtight container... if you haven't eaten them already!